I met Finnish director Lari Teräs a little over a month back in Boise, Idaho at Red Feather's patio where we watched Boise Film Underground's Halloween program of horror shorts. We'd met earlier in the evening at Ming Studios where I learned his first feature Blood Riders: The Devil Rides With Us (2014) [Official site / Facebook] was in the program for the Idaho Horror Film Festival. Unfortunately, I'm not allowed to stay up past midnight (and was none too pleased with the unprofessional projections at the festival anyway) so I begged off on an in-cinema screening and asked Lari to forward a Vimeo link, which he generously provided a few weeks later. His lack of pretension was refreshing. He was visibly enjoying the festival run of his first feature, which he described as: "a blood soaked adventure comedy about four young friends who stumble upon a body after stealing a car. That discovery pushes the friends on a road trip around town during which they try to get rid of the increasing amount of corpses. Along their wild ride the kids encounter neo-Nazis, punk artists, devil worshipers and a plan to resurrect Hitler." Made on a next-to-nothing budget, Teräs pieced Blood Riders together with personal savings and credit cards and—"to keep things simple"—there's "only" 24 speaking roles and "only" 20 shooting location across 7 cities / towns. Working as a best boy grip and background zombie on John Geddes' Exit Humanity (2011) was where Teräs learned most of the tips and tricks of how feature films are shot after graduating from film school. An undeniable labor of love for everyone involved, Blood Riders was shot in 3 weeks (6 days per week; 14-16 hours per day). By huff and by puff and, definitely, with a lot of fun they made the film. 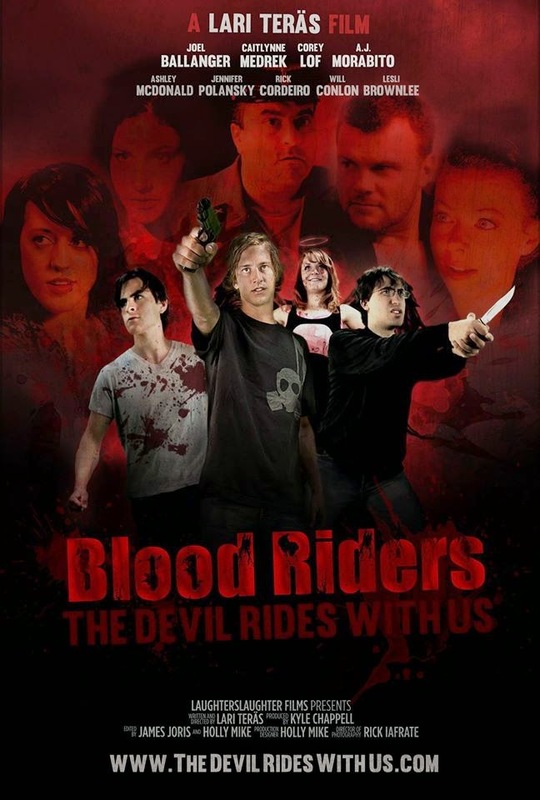 That fun, and the lack of pretension, translates across and makes Blood Rider nothing more than what it is: an entertaining romp of blood, guts and good times. 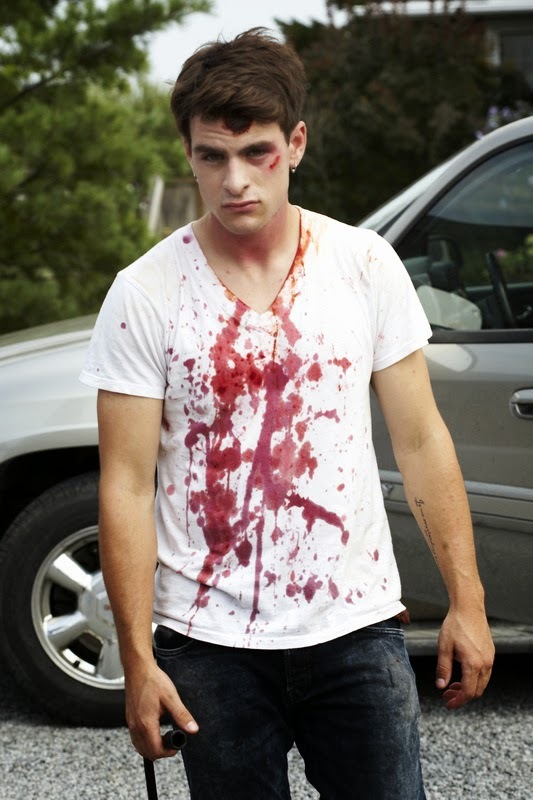 The no-budget bloody mayhem of Blood Riders lies squarely on the shoulders of the earnest performances of its fresh-faced cast. As Zoey, Caitlynne Medrek bemuses as a lass with impulse control problems (and rumor has it her face was sprayed with blood over 60 times on camera); as Janek, Cory Lof provides an attractive and befuddled protagonist barely able to keep things together; and as Dane, Joel Ballanger is as dreamy as a bad boy gets. All three are easy on the eyes so I have to give a shout-out to either casting or Lari's good taste in friends (one and the same?). I predict Ballanger will need a secretary for his future fan club. With humor being the festival's main draw this edition, Blood Riders races out ahead of the pack by a bloody nose. It is, as the director will tell you, "a feel good movie about growing up, making new friends, finding love and overcoming the insecurities of youth: What are you willing to do in order to find acceptance either from yourself or from your peers? It's also a movie about off-the-wall characters, hell fires and the (positive) effects of starting an accidental murder spree in order to cover up a petty crime." All in all, a pretty rad combination.